Abstract: This Geforce 8800GTS-320 lives up to the hype, and comes with one of the best software packages available for its class. Gamers these days have it easy. Back in 'the day' even if with a high end videocard 1600x1200 resolutions and anti-aliasing were not realistic options if you played competitively online. These days, you can play with all the eye candy maxed out on almost all but the latest game titles. The games look a heck of a lot better too. Another great thing about modern videocards is they allow even slightly dated PCs to play games smoothly, since much of the processing is done on-GPU. In other words, while buying the latest and most expensive CPU is never a realistic idea the same is not true for videocards. Buy the fastest and absolutely best videocard you can afford (if you're a true gamer), and skimp everywhere else. ;-) There is a lot of power in a modern GPU, and these dedicated graphics processors are also more versatile than ever before. The GPU is quickly becoming indistinguishable from the CPU. In this review PCSTATS tests the awesome Asus EN8800GTS/HTDP/320M PCI Express videocard. This Geforce 8800GTS-320 lives up to the hype, and comes with one of the best software packages available for its class. In the box is a full copy of Ghost Recon: Advanced Warfighter, which just happens to be one of the hottest shooter titles of 2006. The game looks particularly splendid when played over the Asus EN8800GTS/HTDP/320M videocard too. Take my advice, turn up the resolution to 1600x1200 and kick in AA and AF to get the full affect. 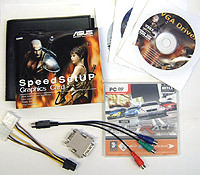 The Asus EN8800GTS videocard is based on the GeForce 8800GTS core, with the standard allotment of 320MB of GDDR3 memory. 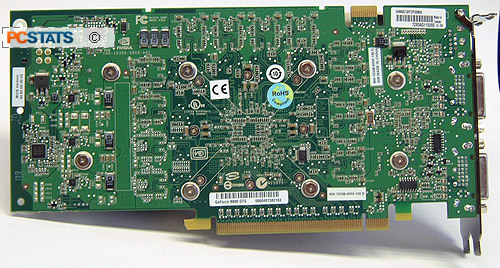 The videocard itself is a two-slotter, and uses the reference nVidia heatsink which operates relatively quietly. The Asus EN8800GTS/HTDP/320M videocard also comes with the game Race the WTCC and a full copy of 3DMark06, handy for those of you into the benchmarking craze. Other accessories include two DVI to analog converters, a dual molex to six pin power cable and a component output cable. At $341 CDN ($308 US, £154 GBP) the Asus EN8800GTS/HTDP/320M is a bit more expensive than the average GeForce 8800GTS 320MB, but the accessories do well to justify this premium. 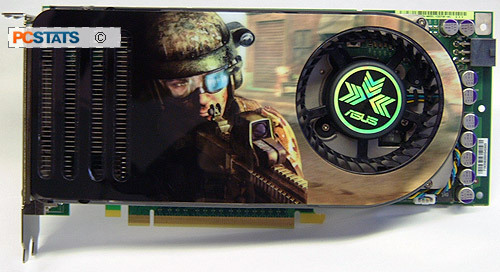 Asus dress the EN8800GTS/HTDP/320M videocard with a flashy Ghost Recon Advanced Warfighter sticker, but apart from this the unit is based entirely on the reference nVIDIA GeForce 8800GTS 320MB. Unlike a few of the GeForce 8800GTS 320MB videocards that have passed through the PCSTATS test labs recently, the Asus EN8800GTS/HTDP/320M runs at stock speeds. Its core is set to 500 MHz, its memory to 1600 MHz. Based on NVIDIA’s G80 architecture, the Geforce 8800GTS GPU relies upon a unified architecture which allows it to dynamically allocate processing power to geometry, vertex, physics, or pixel shading operations. The highlights of this GPU include; DirectX 10 Shader Model 4.0, DirectX 9.0 and NVIDIA Quantum Effects technology for physics computation, and 96 stream processors. Asus' EN8800GTS/HTDP/320M incorporates a Shader clock running at 1200MHz, output display resolutions as high as 2560x1600, HDCP ( High-bandwidth Digital Content Protection ) and High Definition resolutions up to 1920 X 1080i. You don't need to be a computer expert to recognize that Asus EN8800GTS/HTDP/320M is based entirely on the nVidia reference design. In fact the only thing different about the EN8800GTS/HTDP/320M videocard is that it has a Ghost Recon sticker on top of the shroud, and Asus sticker on the fan. Compared to the full fledged 768MB GeForce 8800GTX, the GeForce 8800GTS 320MB videocard is a bit shorter. It requires a single 6-pin PCI Express power connector and has just one SLI bridge connector. The videocard requires a large dual slot cooler, and so it's generally a good idea to make sure the adjacent expansion slot is free. The 60mm PWM fan is temperature controlled and for the most part runs too quiet to notice when installed in a case. Make no mistake about it, the Asus EN8800GTS/HTDP/320M videocard, like all nVidia 'G80' models exhausts a ton of heat. Good case cooling is a wise measure. One nice thing about the EN8800GTS/HTDP/320M videocard is that the heatsink pushes hot air out the back of the computer chassis, rather then just mixing it around inside the case like a fancy space heater. Ghost Recon Advanced Warfighter - I LOVE THIS GAME! Ghost Recon Advanced Warfighter (aka GRAW) is certainly one of the best First Person Shooter (FPS) games I've had the pleasure of playing in 2006. It has stunning visuals and a well thought out story line, and there is no overlooking the awesome game play too. GRAW was one of my personal favorites of the year. Based a few years in the future, the game basically has you leading a group of American special forces into Mexico to save the President of the US, and to retrieve some stolen technology (like the famed Nuclear Football) while battling it out with guerillas, APCs, tanks and helicopters. Based on the Unreal 3 engine, GRAW boasts wicked graphics and its game play that is top notch. Your AI partners when playing single player mode still need a bit of babysitting, but enemy AI is excellent. The bad guys won't play whack a mole with you, most of the time they'll move to a new location to engage, and if possible will flank your position. Pg 9. Racing GeForce 8800GTS 320MB's!